TORTOLA, British Virgin Islands , Dec. 31, 2018 /CNW/ - Sailfish Royalty Corp. (FISH.V) (the "Company" or "Sailfish") announces that, in keeping with the Company's strategy to compensate management primarily with equity, a total of 2,625,000 stock options have been granted to directors and officers of the Company pursuant to the Company's Stock Option Plan. The options are exercisable for a period of five (5) years at a price of C$1.00 per share. The aggregate number of shares issuable to one of the optionees, pursuant to options granted to the optionee in the past 12 months, is in excess of 5% of the Company's issued and outstanding shares and exercise of the options in excess of the 5% is subject to the approval of disinterested shareholders of the Company at a general meeting of shareholders. 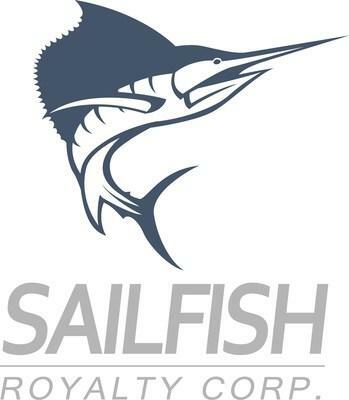 Sailfish Royalty Corp. is a precious metals royalty and streaming company. Within Sailfish's portfolio are two cornerstone assets on advanced stage projects in the Americas: a 3.5% NSR on the Tocantinzinho gold project in the prolific Tapajos district of northern Brazil ; and a gold stream equivalent to a 3% NSR on the San Albino gold project (~3.5 sq. km) and a 2% NSR on the rest of the 138 sq. km area surrounding San Albino in northern Nicaragua . Sailfish intends to aggressively grow its portfolio and become a yield-focused company by paying dividends to its shareholders.